Late yesterday morning local time, a number of armed gunmen attacked the offices of French satirical newspaper Charlie Hebdo in central Paris. The attack was the most deadly terrorist incident in France for at least the last 50 years. But precisely how did this event play out? 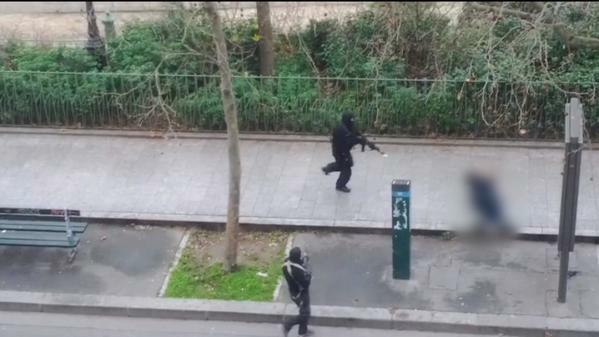 Terrorists arrive on scene by car, while Charlie Hebdo staff were engaged in an editorial meeting. At least 2 armed men forced a staff member at gunpoint to let them in the building. Upon entering the building they proceeded to kill one police man guarding the newspaper’s editor, as well as 8 journalists (including 4 cartoonists), 1 guest editor and 1 office worker. The terrorists then exited the building, exchanging fire with a police patrol. Two machine-gun armed terrorists were then caught on camera wounding, and then killing a 2nd police officer in a nearby street. Finally, they escaped the scene in the same car they arrived in before ditching it, and jacking a different again. Since then a number of other events have played out possibly connected to the search for the suspects. An apartment in Reims, north-east of Paris was raided by French RAID police. Nobody was found inside. A separate raid may have occurred in Charleville-Mézières also connected to the investigation. During the raid, journalists were kept away from the city. The youngest of the 3 attackers turned himself in to police custody at an unknown time last night.